This is an recent project about consumption and the categorization of consumers. 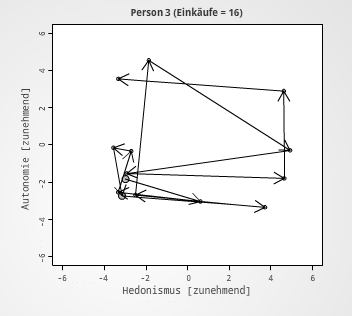 The whole survey you can explore on: http://www.geographie.uni-erlangen.de/projects/konsum/ (german!). For the evaluation, R was used. The Space shows the consumer in the center of a two dimensional abstract space. He is able to “move” to every point in the coordinate system. Each buy he takes a new position. 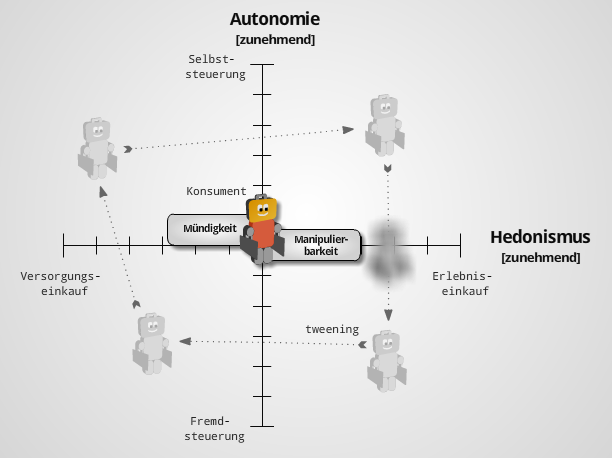 The first dimension is the dimension of hedonism (buying – shopping), the second is the dimension of autonomy. They are both independent. 31 test persons took part in the survey. They filled out a diary about their buys. This is a sample person with 16 buys. The arrows indicate the direction of time, the circle grows for each buy at the same position. This graph compares the buys of different people in the same category of shops. It shows a clustering towards hedonism in fashion shops and a clustering towards buying in drugstores. More on the project homepage.